A couple of weeks back yet another sociological survey concluded that the old division between the working and middle/upper classes was far too simplistic for our modern world. The responses to the death of Margaret Thatcher seems to have put the lie to that. 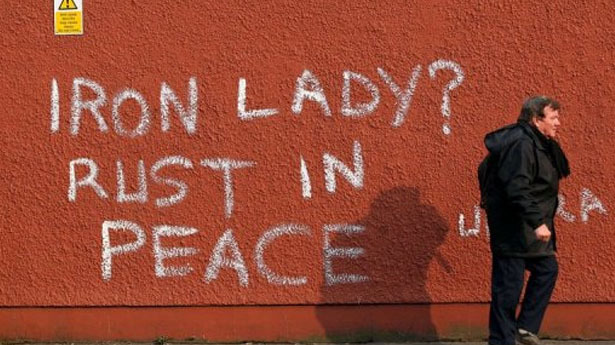 Your response to the very name of Thatcher, in the hours and days immediately after her death, seem to define where you stand in raw class terms. If you were rich and got richer after deregulation then Thatcher is a heroine. For the blighted communities of Scotland, Wales and the North of England there is nothing but bitterness. From the celebration parties in Brixton and Bristol, to the hundreds of unctuous column inches in her praise written by her most reactionary capitalist defendants in the media, the class war goes on – and this a whole generation after she left office. The working class in Britain has seen a real decline in its purchasing power since 1973 (and that’s according to the Financial Times). Thatcher is an icon for all that they have had to suffer for more than a generation. On the other hand for the wealthy Thatcher was “the great transformer”. For them she saved British capitalism. In reality the picture is more complicated than that. Thatcherism just happened to personify a particular stage the world economic crisis had reached and to understand it you need to know a little bit of British history since 1945. As anyone under 40 will not be too conversant with that let’s indulge in a bit of background. Thatcherism as an ideology was forged out of the curious belief in her generation (she was born in 1925) that Britain had actually won the Second World War (a belief absorbed by most of the population through the John Mills/Alec Guinness etc war films of the 1950s!). In fact the British Empire and its Commonwealth that Churchill talked of “lasting a 1000 years” ended up bankrupt in 1945, three quarters of its merchant marine destroyed and its overseas markets and investments taken over by an American ally as a reward for its financial aid during the war. The same ally at the end of the war refused to renegotiate the terms of Britain’s debt, much to the outrage of her chief negotiator, a certain John Maynard Keynes. On top of that the British working class after suffering two world wars and a depression were in no mood to be fobbed off again with talk of “homes fit for heroes”. They wanted real substance from the system. The Beveridge Plan of 1943 promised a new society in which we would be cared for “from the cradle to the grave”. Beveridge was a Liberal and certainly no radical but with strikes breaking out as the war ended and red flags going up on barracks there was a real fear of “Bolshies” amongst demobbed servicemen. To save the day for British capital the Labour Party embraced Beveridge’s welfare state proposals and defeated Thatcher’s hero, Churchill in July 1945, even before the defeat of Japan. But as already stated Britain was bankrupt. Most of its industries were clapped out and many of the owners, although protesting, were only too happy to sell them to a State which was desperate to keep them going whatever the cost. Britain was also in the process of losing its empire (Palestine and Israel were gone by 1948) and the only solution for the Chancellor of the Exchequer, Sir Stafford Cripps was “austerity” (yes, Labour even got that one in first too). Rationing (including bread) continued against a background of squatters’ movements (hundreds of thousands were homeless after the war), factory occupations and strikes. Labour used troops to break strikes and even made the first retreat from Beveridge’s welfare state by introducing prescription charges. Workers failed to vote Labour in 1951 and the Tories returned just as the post-war boom really got started. They too stuck with the nationalised industries and there was a “Keynesian consensus” between all parties on running the economy. In 1959, as real wages rose, Tory Prime Minister Macmillan could confidently tell the voters that “they had never had it so good”. But even as the “Swinging Sixties” started the British economy was already in deep trouble. The big issue then was “the balance of payments”. Britain was importing more than it exported (and really only kept close to solvency thanks to the financial earnings on old imperialist investments, known as “invisible earnings”). The Tories were portrayed by Labour leader Harold Wilson as out of date aristocrats (which was largely true) who had no idea how to run modern capitalism. He insisted that Labour would modernise Britain in the “white heat of technology”. He shut down a lot of steelworks and pits (an often forgotten fact) but his only short-term solution was exchange controls and a devaluation of the pound. The standard belief that held sway amongst our rulers was that there should be no return to the mass unemployment of the 1930s and Keynesian monetary policy was largely credited with creating the post-war boom. This involved deficit financing or printing money for which no goods had yet been produced. The consequence of this was inflation. At first this was not serious as a little inflation encouraged capitalists to invest (as Keynes said it would) but as inflation rates rose so did interest rates and this discouraged borrowing for new investment. They should have read Paul Mattick sr. He stated repeatedly in essays at the time that the post-war boom was nothing but the consequence of the massive devaluation of capital brought about by the war and that the cyclical crises of capital accumulation had not gone away. It would return as the law of the tendency of the rate of profit to fall once again exerted its iron grip. And return it did but not before the Tories were back in power led by the grammar school boy (the toffs were sidelined now), Edward Heath. The Heath Government came in with an avowed intent. His ministers were going to attack the unions (by which they really meant working class demands that pay should match inflation). They were going to shut down whole swathes of British industry and privatise the steel industry. But the introduction of the regressive VAT (to allow the UK into Europe) and the continuing rise in the rate of inflation led to more or less open class war. From 1970-4 there were massive strikes by miners, dockers, power workers, transport workers, shipyard workers (the UCS occupation was then) and just about every section of the working class. Power cuts became so prevalent that we kept candles and camping stoves as standard. Anti-strike laws were brought in and this led to the arrest of 5 dockers for contempt (for continuing to picket in breach of the new Industrial Relations Act). At this point capitalist rule itself came fleetingly into question. Hundreds of thousands of workers spontaneously went on strike as 30,000 of us congregated outside Pentonville prison. The TUC was frightened into calling a “national stoppage” for the week after (as always behind the class – a long way behind – the strikes were already increasing). The very state seemed under threat and it was only the discovery of an “Official Solicitor” (hitherto unknown and never seen again) who released the imprisoned dockers that allowed the Heath Government to climb down. The Tory Right was outraged but further humiliation was to follow when the global economic crisis burst out in full in 1973. To the West it came as the Arab oil shock when OPEC was formed and began demanding a fair price for oil in the face of the now depreciating dollars. Three day weeks, more power cuts, more inflation and a confrontation with the miners led Heath to call an election in 1974 on the theme of “who runs the country?”. He found out it wasn’t him. In fact a year later he did not even run the Tory Party as the Tory Right never forgot nor forgave their humiliation. Orchestrated by Sir Keith Joseph, Heath’s Education Secretary, a grammar school girl who had already gained notoriety as “the milk-snatcher” (for abandoning free school milk for children between 8 and 11 – Labour had already abolished it for secondary school students) became the new Tory leader. The British ruling class hoped that Labour (which had stayed out of the miners’ fight with the Tories) would be able to stabilise the situation by using the unions to tame the working class. However the economy was now in such dire straits that inflation was roaring along. The union leaders were, of course, ready to compromise but their members saw no reason why they should pay for a capitalist crisis. Wilson resigned as the state appeared on the edge of bankruptcy (if only he could see today’s debts!). The IMF was brought in to give the UK a loan. Its conditions were considered draconian at the time and the cuts in the NHS caused particularly bitter resentment. It was Labour PM Jim Callaghan who was the first to abandon the “Keynesian consensus” by announcing that “you cannot spend your way out of a recession”. At the same time he tried to get union leaders to control their members with “beer and sandwiches” talks at No 10 but the union leaders could not deliver. They tried to co-operate on a wages freeze but the cuts led to a tripling of unemployment to 1.5 million. This was the background to the “winter of discontent” spearheaded largely by low paid council workers who were already worse off. Callaghan called an election for June 1979 and the Tories campaigned on the slogan of “Labour isn’t working”. Thatcher scraped in as Prime Minister but there was little indication yet that we were on the verge of a global shift in class relations. Thatcher came in misquoting St Francis of Assisi in calling for social harmony and really had no grand plan in 1979 other than to revive the agenda of 1970-4 Tory Government. She stuck rigidly to Labour’s IMF medicine (which was already monetarist) and the cuts increased. But so too did inflation (which went up from 15% when she got in, to 22% in two years), and unemployment, which officially doubled again to 3 million. Even these were massaged figures since the calculation of unemployment was altered several times (one innovation was a new line in political deceit known as “spin” – Blair took it to new heights later) and the real figure was much higher. On the class war front she had one success with the defeat of the steelworkers after a thirteen week strike at the start of 1980. In this she was aided by the ISTC leadership under Bill Sirs (we will never forget the scene of steelworkers tearing up or burning their union cards after the negotiations betrayed the strikers). Sirs, later to be a personal friend of Thatcher, did get picketing help from the miners (an assistance which he refused to reciprocate in 1984) but found it unwelcome. Most of all though, Thatcher’s success in the steel strike was down to one thing. This was not a strike about trying to keep up with inflation. It was a strike to defend jobs. And when the capitalists have given up on an industry they don’t care what damage it does. And this was what was now different. Up to this point it had been a central plank of all industrialised economies that you had to defend the “commanding heights of the national economy”. It did not matter whether they were nationally or privately owned they had to be maintained whatever the cost as they were essential should a new war break out. By 1982 not only was the Second World War long over but the invasion of Afghanistan by Brezhnev’s USSR in 1979 (the first such adventure outside its bloc since WW2) indicated that the USSR was in dire straits. Britain’s basic industries were undercapitalised and, in any case, under the protective umbrella of the USA were not so essential. If the working class would not go along with restructuring the industries could be abandoned. The policy was not yet cut and dried though. In 1981 Thatcher announced the closure of pits in South Wales but backed down in the face of just talk of a strike. The Tories still feared the miners and with their poll figures dire retreated to regroup. At the beginning of 1982 even The Times (not yet owned by Murdoch) was recording that Thatcher was the most unpopular Prime Minister of all time. The world economic crisis however was not confined to the UK. In Argentina after years of a murderous military dictatorship the working class were taking to the streets and strikes were breaking out everywhere. At the time the British and Argentinians were in negotiations over the future of some small islands in the South Atlantic. The British were not really interested in them and due to some inept diplomacy (Lord Carrington the Foreign Secretary later resigned) gave the impression that they were going to let Argentina have them. When the Argentinian dictator Galtieri got wind of this he saw the “short victorious war” option as a way to deflect attention from the crisis of his rule in Argentina. Ironically if he had been able to wait 6 more months he might have had more success as the British Navy was about to be drastically pruned as part of the Thatcher cuts. But in March 1982 those cuts had not actually been carried out. Thatcher gloried in the opportunity to play Winston Churchill (although appalled by US offers of mediation with Galtieri which she saw as a form of treachery). What followed was a predictable UK victory against poorly equipped Argentinian conscripts. Galtieri’s game was up as soon as the British decided to fight. Good news for the Argentinian working class who were able to eventually get rid of their bloody oppressors. Bad news for the British working class as the jingo press (headed by Murdoch’s media empire) transformed the most unpopular Prime Minister of all time into a landslide election winner the following year on a wave of nationalism unseen since the early days of the First World War. Thatcher’s second term was the real turning point for the working class. Transferring Ian Macgregor from the steel industry to head British Coal was the signal that the next target was the miners. However it was not Thatcher but Nicholas Ridley who identified the strategy and tactics. In the so-called Ridley Plan pit closures were to be announced but only after most coal transport had been transferred from the railways to private hauliers, police operations were centralised, more power stations were gas fired, power workers and the police received massive pay rises, and coal was gradually allowed to stockpile at pitheads and power stations, and negotiations started with Nottinghamshire miners’ leaders to keep out of the strike (with the false promise that their pits would be spared). The NUM leadership spotted what was happening but the work to rule did not dent the stockpiles very much and the final announcement of the pit closure programme was delayed until February 1984 (i.e. as the winter was nearing its end). The miners’ response was a spontaneous walkout at Cortonwood, South Yorkshire followed by other pits elsewhere. Thatcher herself was appalled that the strike could last over a year. She had thought that by getting people to buy their own council houses the building society would foreclose on the mortgages of striking miners only to be told that in mining communities the building societies just dared not do that or they would have no clients. Had the miners not been isolated (and “Coal not dole” was not a slogan to help get over that) then when dockers struck in August 1984 the situation might have changed. But the union leaders and the TUC kept the strikes apart and the miners, as in 1926, soldiered on alone. They were defeated for the same reason as the steelworkers. You cannot strike to defend jobs when the capitalists have already decided to abandon the industry you work in. If it had been transformed into a discussion about what capitalism could no longer afford it might have united workers. But the miners simply thought they could win alone as they had done in the 1970s Even then it cost the Thatcher government a fortune to defeat the miners and without the revenue from North Sea oil rolling in they would not have been able to afford it. The fact that Norway developed a $700 billion sovereign wealth fund out of its oil money whilst Thatcher used it to pay off immediate debts does not look like capitalist wisdom today. However as we wrote at the time the defeat of the miners meant the defeat of the entire working class (and not just in Britain). The defeat of the printers at Wapping the following year only underlined our message. And new computer technology was now coming on stream which not only made the printers redundant but was to undermine the need for large congregations of workers in any industry. The fact that Thatcher’s time in power coincided with the microprocessor revolution was for her entirely fortuitous. Restructuring was now a global phenomenon. The second great claim of the Thatcher era was that she had “rolled back the frontiers of the state”. It is true that many industries and public utilities were privatised but a close scrutiny of what really happened to the state does not quite accord with the legend. In the first place privatisation did not begin as an ideological crusade but as a response to a pragmatic need. The telephone network was as antiquated as most other British industries but massive investment was needed to turn it round in the face of the new technology. The state could not afford it so the solution was to tender the job out and offer shares to anyone who would buy into it. Naturally each asset was massively undervalued and sold off at a knockdown price (as were all later privatisations). Ex-Tory Prime Minister Macmillan complained that Thatcher was “selling off the family silver” on the cheap but now the ideological crusade was in full swing. Instead of Thatcher’s much hated state monopoly we were supposed to see thriving competition but in fact the monopoly either remained (as with BT today) or the different companies that were set up all monitored each other so closely that it amounted to a cartel situation (witness the gas companies). In every case those with wealth got wealthier whilst workers lost their jobs to make the “bottom line” more profitable. Even here though Thatcher offended the monetary purists. In order to keep the headline rate of unemployment down she expanded disability benefit which they could apply for which did not count as being on the dole. No-one centralised the power of the state more as she undermined local government everywhere (and rigged the central grant system to benefit richer Tory shires to the detriment of de-industrialised towns). It is no accident that there are no longer Tory MPs in Scotland and precious few in the North of England and Wales. Thatcherism is the voice of “little England”. Rather than rolling back the frontiers of the state government spending as a percentage of GDP was around 40% when she left office or much the same as it always had been. In fact Thatcherism, “Reaganomics” and all the other neo-liberal ideas have not succeeded in rolling back the frontiers of the state as much as they claim despite all the deregulation. All that has happened is that the state has shifted its role in the face of the capitalist crisis. All it has meant is a massive transfer of regulation onto the working class whilst removing the protection of the state that they had previously enjoyed in many areas. Anti-strike legislation has made it illegal to do almost anything to fight back. When the Big Bang (the deregulation of the financial markets) occurred in 1987 one financier likened it to the “descent of the Holy Ghost”. They certainly thought that they had arrived in heaven. Greed was now good and the first step en route to the speculative financial bubble, which the New Labour Party continued until it burst in 2007, had been taken. Thatcher once infamously stated that “there is no such thing as society”. It summed up the capitalist conception of the economic system as consisting of free individuals making free and equal contracts with each other which was the nostrum of neo-liberalism. The crisis of 2007 showed just how ridiculous that idea was under modern capitalists conditions. The banks and the financial system were suddenly revealed as essential for “society” and the state was mobilised to save banks in order to save “society”. Welfare for bankers has replaced welfare for workers. After hubris comes nemesis. And Thatcher eventually over-reached herself on the poll tax. Having abolished the 40% tax on high earners she now came up with the super wheeze of making millionaires and paupers liable to the same local council tax. The mistake she made here was to attack the entire working class as one and the response was the poll tax riots. The popularity of the Tories plunged and with a possible defeat in the 1992 General Election facing them the Tories began to plot and eventually ousted a disbelieving Thatcher. To many of her admirers Thatcher has succeeded in turning round the British economy but in truth the crisis that she and her predecessors, Labour and Tory, inherited still goes on. Thatcherism and neo-liberalism, “Anglo-saxon capitalism” or whatever name the journalists give to it has not altered that fact. Capitalist re-structuring in the face of the microprocessor revolution has taken place across the planet. It has meant the reduction of manufacturing jobs in the advanced capitalist states and the globalisation of production (i.e. transfer to low wage areas). This was not Thatcher’s doing but the result of the way the system responded to the crisis. The speculative bubble which deregulation in the UK and US launched went on for longer than we expected but burst we knew it would and today’s stagnation is the consequence. In reality the only way in which the system can escape from its economic crisis is via a massive devaluation of capital. This will mean a global war of some form. Global capitalism is still in crisis and with or without Thatcher the outcome would still have been the same. Thatcher just added the class rhetoric. Saying this will annoy many workers who believe that she alone is responsible for the destruction of their communities. Thatcher was a thoroughly odious person, deeply racist (her support for apartheid was more than enthusiastic), a supporter of the bloodthirsty butcher Pinochet in Chile, her notion of freedom was a capitalist one. Freedom for the exploiters to do whatever they like. Collective resistance was for her treason, and she was absolutely blind to the suffering she brought on millions. But she is not the problem and in truth never really was. The problem is capitalism. When she said “there is no alternative” to the cuts and lay-offs she was only saying what the global capitalist class already knew. There was no alternative for them. For the working class giving support to those who think that there is a softer way to run a system which can only exist on the more brutal exploitation has been shown to be a mistake. Thatcher revived the bestial appetites of the profiteers without reviving the capitalist economy. Those on the Left who demonise Thatcher today have their own agenda to reform the system which spawned Thatcher. Those days are over. The real culprit is the system of which she was a loyal servant – capitalism. Its time to focus our attention on fighting that in order to provide our class with a future. There is an alternative but it is one beyond the bounds of capitalism It is in the original communist vision of Marx so badly deformed by the Stalinists, Maoists, Guevarists, Castroists and even Trotskyists who have all created state capitalist monstrosities wherever they have achieved power. Marx’s vision is for a society without money, national frontiers, a state, or classes. That is the basis of our programme for the future of humanity. For me the biggest lesson of the Thatcher years was that it highlighted the total bankruptcy of reformist organisations in opposing the attacks of the bourgeoise then as now. Lets not forget that the majority of the strikes that took place during the 1970's came from the shopfloor and not from the union leaderships themselves. In fact many union leaders from the district upwards were running round in a panic trying to put a lid on the strikes. Thatcher never wished to smash the unions as organisations in fact what she wanted as well as the union leaders was a stop to so called wildcat strikes. And this is what in fact occured when workplaces were closed down and union leaders allowed victimisations to go through. One thing to remember however was that while the economic militancy of the period was impressive it did not in itself pose a serious challenge to the way capitalism itself operates. It developed within the parameters of capitalism and accepted the logic of the capitalist market. This is not to say that strikes are not usefull they are but that they need to go beyond a quasi syndicalist approach and develop into conscious class struggle approach. To achieve this there needs to be a Marxist party whose members is grounded in Marxist theory and can participate in struggles whixch begin as reformist struggles but can go beyond this. The organisations in the 1970's such as the Stalinist CPGB could not. Let's hope one can develop this time around before either a global inter Imperialist war breaks out or society decomposes into some dystopian nightmare. Thank you to Jock for a most impressive article. He closes by asserting that there needs to be a Marxist party (etc). I agree, because the average punter has been wading through numerous websites and publications, over recent and earlier yesrs, in which each allegedly marxist party has, one way or another, been slagging off other ones. At present, as usual, there are calls and some efforts to gather support for a new party, as can be seen on three (or more) websites of Trotskyist organisations in the UK, and similarly the calls to attend the Peoples Assembly in London. It seems to me that unless the CWO/ICT comes up with at least an embryonic party for workers to apply to join, the only available ones will only be those of which the CWO/ICT dissaproves. A straightforward procedure for workers to join what CWO/ICT would probably declare to be a more correct and useful party would, as I see it, be a step forward to communism in the UK and world. Otherwise the status quo continues, so far as parties and workers are concerned.